How do I set up an international charity? 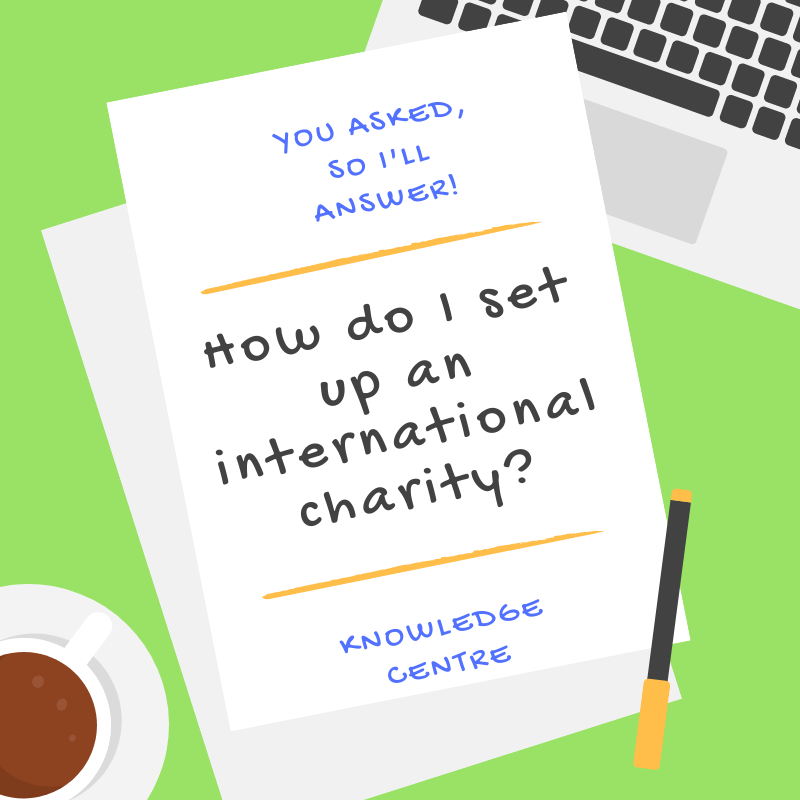 You asked, so I’ll answer – How do I set up an international charity? If you’re like a lot of social entrepreneurs you might want to expand your reach and work internationally. Having worked in Thailand recently, I thought I’d share how you can set up a charity that works internationally. If you already have a CIC, company or a charity in the UK, and now want to expand the geographical area you work in to include other countries or the entire world then you can choose any of the three options below. If you don’t have anything set up in the UK already then option 2 or 3 are relevant for you. Unincorporated charities – if your income is under £10,000 and you don’t own land you can change the objects yourself without permission from Charity Commission, providing they are still charitable and as similar as possible to the objects they replace. You then approve these at your next meeting and send an updated copy of the constitution to Charity Commission (if your charity is registered with them). For charitable companies and CIOs you’ll need to get Charity Commission’s permission to make the changes first in writing – before you approve a special resolution at your general meeting. Once you’ve approved the changes at your meeting you need to send the special resolution and the updated Articles to Charity Commission within 15 days. If you’re a charitable company (not a CIO) you also need to send both these documents to Companies House within 15 days. If you’re set up as a limited by guarantee or limited by share company (not a CIC) then you need to fill in form CC04, complete a special resolution and amend your articles – and send these documents to Companies House. This simply requires you to register a new CIC or a new charity/CIO with its object including the activities you want to deliver and the countries you intend to work in (or saying you will work internationally if you intend to work in lots of different countries). Many countries have a foundation or NGO (non-governmental organisation) legal structure that is used by charities. These structures typically require individuals who are resident in that country to be trustees as well as you (but not always). Depending on which country you want to set up your not for profit in, it can be costly and require a legal advisor to complete the process. It’s not usually as simple or as cheap as it is to set up in the UK. For example, if you wanted to set up a NGO in Kenya you’d need to have at least one Kenyan as a board member. I’ve had clients that set up UK CICs (as a similar type of legal structure isn’t available in their country) and worked in Greece, Spain and South America. The same with charities – where the charity works in both the UK and specific countries overseas. The benefit of doing this is that you can potentially access UK trusts and foundations for grant funding to work overseas. If you set up a not for profit or NGO overseas they aren’t usually eligible to access UK trusts and foundations directly – they’d need to partner with a UK based organisation to access the funding.